(Montpellier, April 10) After five months of constant presence at traffic circles, toll-booths and hazardous Saturday marches, the massive, self-organized social movement known as the Yellow Vests has just held its second nationwide “Assembly of Assemblies.” Hundreds of autonomous Yellow Vest activist groups from all over France each chose two delegates (one woman, one man) to gather in the port city of St. Nazaire for a weekend of deliberation (April 5-7). This shows growth from the original Yellow Vest uprising which began as a protest against a hike in taxes on Diesel fuel imposed in the name of the “saving environment.” (Less well known is that only 17% of that tax was actually earmarked for the environment. In any case, Macron rescinded it in an early attempt to pacify the movement.) 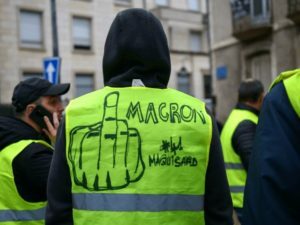 Since then, the Yellow Vests have tentatively converged with the environmental groups, whom many poor and working-class Yellow Vests can’t help seeing as bourgeois on bicycles wanting to be nice but unwilling to struggle directly against the establishment. The Assembly of Assemblies reaffirmed the Yellow Vest founding principle of keeping clear of political parties. Also of leaders. To my mind this is a genius stroke. Every popular mass movement I have participated in over the past 60 years has been co-opted by the establishment (or crushed). Leaders set up an office, they try to raise money and gain access to power, end up compromising; they treat the rank and file activists like a mailing list and the power and dynamic of the mass movement melts away – like the Nuclear Freeze which once mobilized millions. Eventually, the Democratic Party lures them. Here, the Socialist Party swallowed SOS Racism, the embryo of a much-needed Civil Rights movement here in France. As far as Europe is concerned, the Assembly, far from calling for a “Frexit,” reached out to social movements in the other countries of the European Union in a call to come together and struggle against its neoliberal policies. The Assembly saw no point in voting in this sham election. As everyone knows, the European Parliament has no power or even visibility. It’s not even in Brussels, where the important decisions are made by representatives of the German banks and multinational corporations. Moreover, it limits the deficit spending of its member countries, thus making it illegal for France to finance the social services and environmental reconstruction the people are demanding. On Monday, the Public Prosecutor and President Macron categorically denied that she had had any contact with the police, and the President, interviewed by the local paper, made a hypocritical apology, “wishing her a speedy recovery and hoping that she might learn some ‘sagesse” (literally “wisdom” but typically applied to children in the sense of learning to “behave”). Nonetheless, Macron, a former Socialist, is still seen internationally as a progressive, democratic leader, efficiently modernizing France’s archaic “exception” to neoliberal dogma, basically a friend to human rights. The extraordinary violence of his regime has remained hidden behind a smokescreen of demonization of the Yellow Vests and de facto censorship by the mainstream media. Even the liberal New York Review of Books, which in the 1960s printed a diagram of a Molotov cocktail on its front page, has clung to this line, placing the blame for “violence” on the protestors. So before leaving this subject, let’s look at some unpleasant statistics and then examine the role of the Black Block of so-called casseurs (“trashers”) in sustaining this image. Flashballs, manufactured in Switzerland, are listed as “sub-lethal military weapons” but when they cross the French border they magically become crowd-control devices. They are extremely powerful and accurate at 50 yards, and the number head-wounds indicate that they have been deliberately aimed at demonstrators’ heads, as have been tear-gas canisters and grenades. A certain number of casseurs have been spotted (and videoed) as police provocateurs, infiltrating the demonstrations, smashing stuff, and then being filtrated through police lines. This is an old French police tactic designed to spoil the image of a demonstration and justify violent repression, but the whole truth is that Europe is full of angry young men, self-styled anarchists, deeply invested in fighting the establishment by smashing its symbols. They come in from all over Europe. The new “anti-casseurs” laws that Macron is pushing through the legislature will legalize and set in stone for the future the repressive practices used against the Yellow Vests, making them permanently available to his successors (for example Marine Le Pen). They have nothing to do with actual casseurs (who are obviously breaking existing laws and need only to be apprehended under them) and everything to do with making it nearly impossible for ecologists, trade unionists or Yellow Vests to demonstrate. This convergence of other groups, along with the new perspectives flowing from the Yellow Vests’ Assembly of Assemblies, may mark a new phase in their long and lonely struggle against Macron’s harsh, anti-democratic, neoliberal regime in its implacable drive to wipe out the relative advantages in living standards, social services and personal liberties won by previous generations of French people in 1936 (the general strike), 1945 (the Liberation) and 1968 (the general strike and student uprising). Indeed, since 1789 (the Declaration of the Rights of Man, which enshrines the people’s right to demonstrate grievances). See James Surowiecki, The Wisdom of Crowds: Why the Many Are Smarter Than the Few and How Collective Wisdom Shapes Business, Economies, Societies and Nations (Anchor, 2005). Typical of Yellow Vests’ sense of autonomy, our Montpellier/Peyrou group, although happy to join the Oct. 13 demonstration (which has received an actual permit) reserves the right to break off from the official group, march around where they please, and return when they choose. You can only « have » a right if you use it. During Act 21, after chasing around town with the cops on their heels, they ended up on the main square and spontaneously formed a very long line and began dancing an improvised Medieval dance to the rhythm of drums, flutes and noise makers.